No matter how simple or paired down a gown can get, some women just can't get into wearing a dress even on their wedding day. For this reason, the classic suit is becoming a stylish alternative. Like the sheath it's long and columnar only in two-pieces with a jacket and straight skirt. There are of course exceptions. Skirt shapes can be flared like A-lines or take on full bell contours even under man-tailored jackets. Pantsuits are another option with pant legs varying from slim cigarette widths to wide culotte cuts. Getting married in a suit isn't exactly a 21st century innovation. Wartime brides of the 1940s wore suits or their 'best dress' out of necessity because of restrictions on silk—even rayons. Mainboucher designed Wallis Simpson's blue crepe suit when she married the Duke of Windsor in 1936. 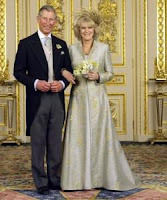 Other suit brides include Bianca Jagger, Mia Farrow, and more recently Camilla Parker-Bowles who wore coat/dress ensembles for both her civil and church ceremonies. There's something about a well-tailored suit on the right bride that conveys a certain élan—she projects sophistication and independence. If you are picturing yourself more tailored than romantic on your wedding day, realize you might face some challenges. Need I remind you the mainstream of bridal fashion these days is focused on plunging necklines and layers of tulle? The good news is, for the most important day of your life, you can wear a suit instead of 'The Dress' without being mistaken for a Bride's Mom. The other news is, you may have to hunt a little harder than the average bride to find those clean lines you like so much. (more on that later). So what differentiates the wedding suit from the everyday business suit? Typically, the fabric in a wedding suit or coat will be special. Considering the season, winter for example, peau de soie and brocade are luxe, heavier materials that sculpt to the body well and hold their shape. A high quality wool suit fabric can go any season. Imagine a wool crepe suit in white or ivory, lined in a lightweight pure silk; it will have a totally different appearance than what you wear in the office or boardroom. Linens, and medium weight silk shantung or dupion have just enough weight to tailor well and look chic for spring-summer weddings. The basic cut of the jacket is going to be the same one you are used to—either a single or double breasted jacket. More radical styles would include Neru, Mandarin or Cossack. Shorter jackets like the Eisenhower and Bolero look best with skirts having higher waistbands, giving you a more columnar look. Tailored Jacket-The classic. Either single or double-breasted, the tailored jacket ends just below the derriere and can have a notched or shawl lapel or no lapel at all. Ideal with a floor-length straight skirt. Dressmaker Jacket-Shorter than the tailored jacket, this cut ends at the hipline and can be single or double-breasted. Like the tailored jacket, it has the same collar treatments. Tailoring usually has softer lines. Nehru, Mandarin or Cossack Jacket—All are ethnic inspired. All have high turtleneck style collar. Typically tunic-length, each has its own ethnicity distinguished by trim or the fabric used to create it. For instance, Mandarin jackets are usually made out of brocade. The Cossack is made out of any type wool and has a row of trim around the collar, extending down the side front of the jacket. Three-Quarter Length Jacket-Longer than the tailored jacket, this cut is usually worn over a straight or A-line style skirt and removed once the ceremony is over. Eisenhower-Popularized by the General during WWII, this jacket crops at the waist and is typically double breasted. Eisenhower jackets had a revival period during the mid-70s and have continued to be a fashionable alternative. The skirt is one element that really makes the wedding suit special. Formal and semi-formal weddings call for a long floor length skirt. The cut of your skirt could be straight or A-line. 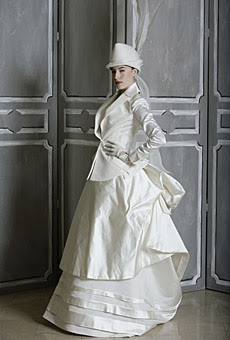 Even a full skirt complete with a formal train works well as a suit component considering it has the proper linings and understructure (read: slip or crinoline) to balance out the jacket worn with it. If you don't feel comfortable in a skirt, by all means wear pants. And don't hesitate wearing a veil with a pantsuit if a veil is what you want. Be gutsy and make your own trend! Want more choices? Coatdresses and coat & dress ensembles (like Camilla wore) are an option many women overlook simply because not many are shown these days. A coatdress is just that: a lighter weight coat (street or floor length); and can be single or double- breasted. Then there's the coat & dress ensemble. Simply put, this is a coat with a dress out of matching fabric underneath it. In the 60s, these were popular mostly for formal occasions. If you like the idea of a fitted coat, you could wear one for your ceremony—long or short—over a corresponding sheath. After the ceremony the coat could be removed so you could move freely throughout the reception. Accessorizing a suit with bridal touches is one of the ways you can customize it for a wedding. Everyday buttons on a jacket can be easily replaced with fabric covered or jeweled ones. Your jacket can also have couture techniques such as hand-bound buttonholes. If your suit has a formal floor-length skirt, topping it off with a longer veil really gives it that wedding feel without going 'all out' as a sweetheart bride. Shorter veils like fly-aways (shoulder length and above) or poufs of netting go great with suits. If you're not the veil type, consider a hat or headpiece that compliments. Hats and suits go together, especially a hat with some kind of veiling over the eyes. It takes the place of a blusher and offers a certain sophistication to being veiled rather than that symbolic 'being given away' business. Gloves really tie your whole look together and add a touch of formality when you want it. Kid gloves are the most elegant; net and crocheted ones give a more vintage or feminine feel to your ensemble. The trick here is to shop in the opposite direction the traditional bride would. The exception is the bridal salon that features one or more of the few designer lines that offer suits. Selections as of this writing are still pretty limited though. Initially your search for ideas will probably begin online. Once you get a thought of how you want the skirt and jacket to look, print out the combinations. From there sketch them how you want. Next you might go to a fabric shop. Yes, to look at fabrics but also to comb through the pattern books. Pattern books are great for finding looks you can take with you. Or go online to www.vogue patterns.com. Look under coats and suits and you'll find plenty to browse through and get inspired. If you take the department store route for buying a suit, you might find a particular designer has the suit you like but it's available in every color but white. The designer or store carrying it may be able to special order it in white. If you're satisfied with the idea of a ready-made suit, department stores might be a better option than anywhere, especially if they have an established relationship with the manufacturer. Salespeople within departments know their lines and designers well and can steer you in the right direction. You might be able to find your jacket by one designer—your skirt by another. Be warned though. Just make sure the shades of white aren't too far off that they can't be worn together. There is on the other hand a down side to department stores: If you want that particular fashion edge their merchandise probably isn't as forward-looking as say, the one-of-a-kind boutique or specialty store. And believe me, a bridal suit should be classic, yes, but something about it has to be different. The kind of different only a tailor or designer can translate. Check out boutiques and specialty stores. They may not have the exact suit you want but they may be able to create one or point you to a first-rate tailor or custom designers who can. . If you can't find what you want in a salon, department store or boutique and are serious about that real 'tailored look', find a good tailor, preferably a men's tailor (they're so skilled). Use some of the same guidelines for finding a tailor that you would a designer or dressmaker. Once you find your good tailor, he (most likely a he) will either have an array of fabrics in house or help you scout your desired materials out. Chances are you'll want an exclusive fabric you can only find in a specialty store. A tailor knows how to take all the proper measurements and create a look you want . . . the look that undoubtedly says, You and sets you apart.